Choosing a tea can be like choosing a wine. The choices, origins, personalities, and prices seem unlimited. Granted, the tea aisle in the grocery store isn’t quite as extensive as the wine aisle…yet. But especially if you decide to invest in loose-leaf tea, visit a tearoom, or tea bar with so many choices, where do you start? For the next few days, I plan to share with you what these factors are, how to consider them, and some of my personal recommendations as a result. Today let’s consider the time of day you want to drink tea or host your event. 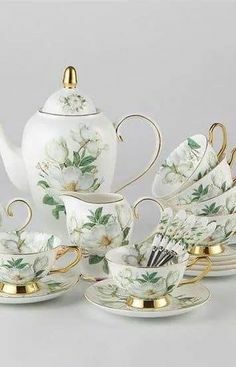 As my regular readers know, I firmly believe that starting a daily tea ritual is one of the simplest ways to bring beauty and health into your every day life. I cannot recommend it enough. So ask yourself, when during the day would you most enjoy sitting down with a cup of tea? Or, have you decided what time of day you will host your tea party? Upon waking or with breakfast is when a touch of caffeine is often the most appreciated. This is when I drink the strong blacks. This can include traditional blends, an estate tea, or a flavored black. 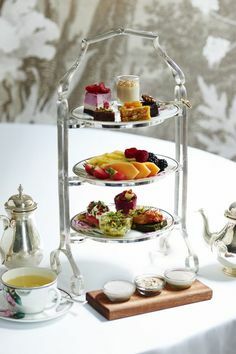 If you are looking for a morning tea I recommend English Breakfast, a hearty Ceylon, or a spicy Chai. Taking time for an elevenses break is often difficult. However, if you spend the majority of your day in a sedentary job, it provides a wonderful excuse to take a break, stretch your legs, and brew some tea to help get you through a couple more hours of work. If you work away from home, a tea that isn’t as picky about brewing time or water temperature is a good choice. If I worked away from home every day, I would definitely invest in an all-in-one triniTEA electric tea maker that boils water, steeps leaves, and filters tea at a touch of a button. If you can control water temp and brewing time, I recommend drinking a green tea. If you can’t invest in a rooibos. “Meet me for tea at three” is a common phrase I use at Tea Party Girl. If you can, especially if you are home with young children, consider implementing a simple afternoon tea in your daily routine. In our home, three in the afternoon was magic hour where all my children’s wishes for computer time, sweets, and videos came true. 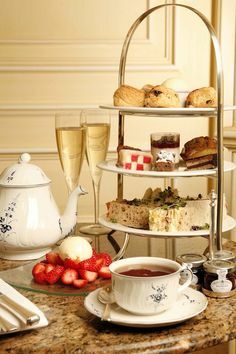 I would make a pot of tea, lay out some cookies, get them settled down for “media time” and indulge in some quiet time with my tea in another part of the house. Pots of tea to welcome children home on a colder school day can be a wonderful tradition as well. Take my word for it, children learn to love tea! A few teas I recommend introducing to children that you will enjoy too are flavored decaf blacks or rooibos teas, especially with hints of vanilla or caramel. If you want to host a traditional tea party and not base it around a meal, mid-afternoon is the best time. I wrote an article that includes tea and food pairings to help your decision about what to serve based on your menu. 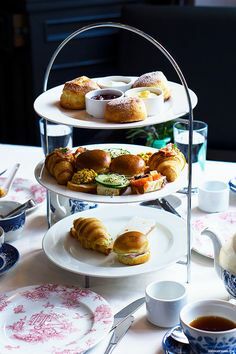 If you want to serve tea during dinner, the traditional “high tea” (dinner served at a high table vs. afternoon tea traditionally served at a low table and not a meal), consider the food pairing recommendations as well. My favorite tea to drink with dinner is a naturally decaffeinated oolong. In my home, if we host anyone for dinner, we always offer a tea afterwards. I choose this more than I choose to serve tea during dinner, truthfully. It’s a wonderful addition to dessert. If I want a little touch of something after dinner and SHOULDN’T eat dessert, I drink a dessert-based rooibos. Sometimes I add a touch of milk or ehem, brandy and a beautiful sugar (not completely calorie free, but better than a slice of cake!). Maybe your ideal time to relax with a cup of tea is after the house has quieted down for the day and you need a transition before bed. Tea I recommend drinking during this time are ones that include chamomile or peppermint. So, after reading this article, what time of day will you drink your tea? I’d love to hear from novice and experienced tea drinkers alike. If you already drink tea everyday and could only pick one pot per day, when would you brew it?